I have mixed feelings about this place. I was really excited when I heard they were going to open a casual hibachi place in the new Uptown district in University Circle. I love hibachi and, even though it wouldn’t have any of the showmanship, I was excited about the possibility of hibachi-like results at a cheaper price. Especially one so close to my home. The folks from Shinto in Strongsville are the force behind Kenko. I anxiously awaited the opening, which seemed to take forever. It opened on July 7th and is located just past University Hospital next to Rascal House Pizza. There is also a rear entrance off the valet area of the Courtyard Hotel. I waited a couple days after they opened to let the crowds die down. I paid for parking in the little lot off Mayfield and headed in the Euclid Avenue entrance. The lines are a little confusing. The line on the left is for those ordering sushi. 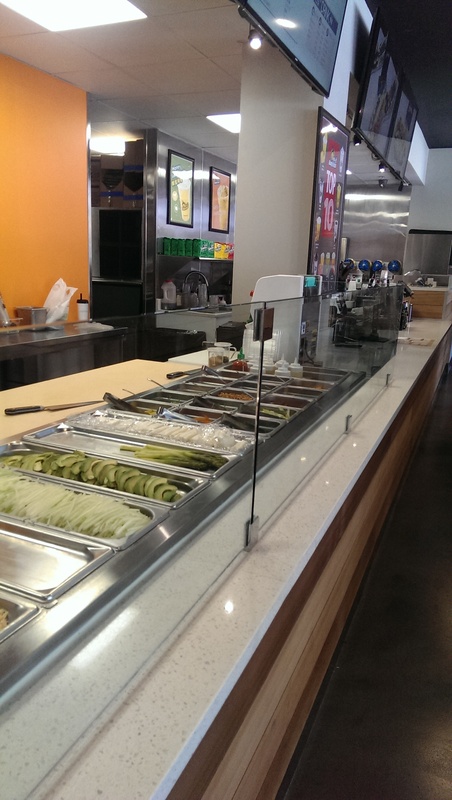 If you want a teriyaki bowl or bubble tea you order that at the cash registers to the right. I have to say the most exciting thing about this place is the Kung Fu tea. It is really good. A lot of the reviewers on Yelp are raving about how excited they are to have Kung Fu tea being served in Cleveland. Their bubble teas are tea and milk-based tea drinks originally from Taiwan, with added tapioca pearls (boba). 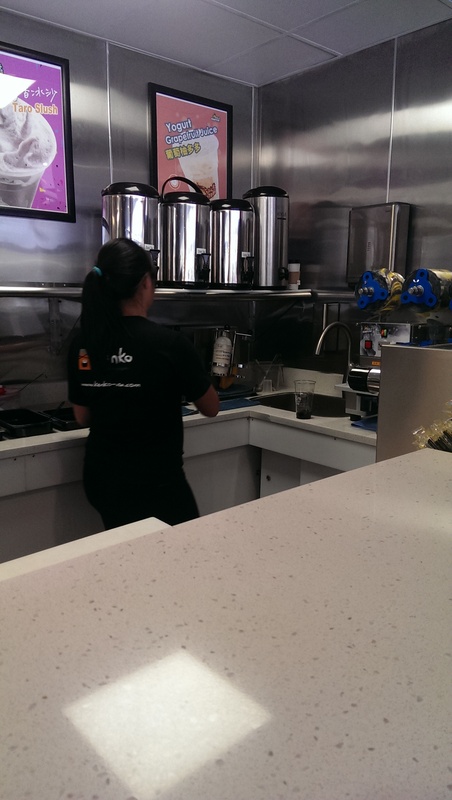 Kung Fu Tea is a bubble tea chain that is popular all along the east coast, and Kenko is the only place in Cleveland that serves it. It is a neat little set-up. They have a ton of different flavors, and you can order it with milk and/or boba. You can also choose how sweet you want the tea to be (30%, 50%, etc.). The person behind the counter prepares it, puts it in some kind of shaker and then into another machine to seal it with plastic. On my first visit they were out of green milk tea, so I went with the plain milk tea. It was really flavorful. On my second visit I ordered the green milk tea with bubbles. I liked that one even more. 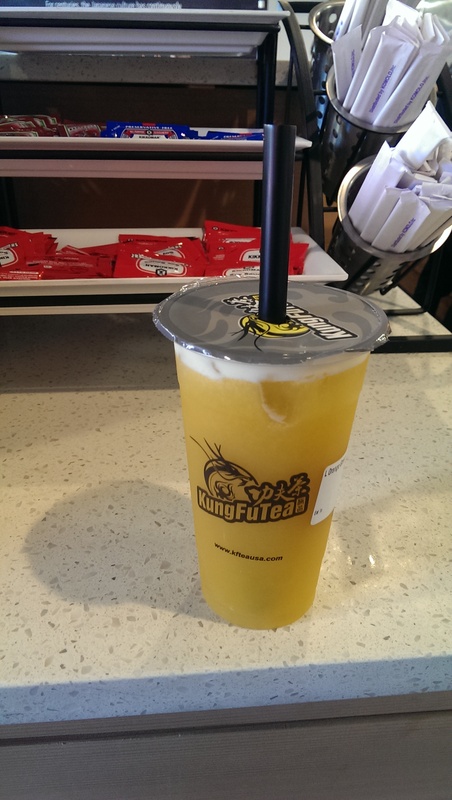 The boba are somewhat sweeter than other bubble teas I have tried. You can also order all kinds of flavored black and green teas. I think I’ll order the orange green tea next time. They have a sign featuring their top 10 selling flavors if you are overwhelmed by the choices. Anyway, on to the food… On my first visit they were out of the gyoza in addition to the green milk tea, so I ordered a miso soup. It was palatable, but it didn’t wow me. It didn’t have a lot of tofu or seaweed like at some other restaurants here in Cleveland. I’ll spare you the picture because it is boring. 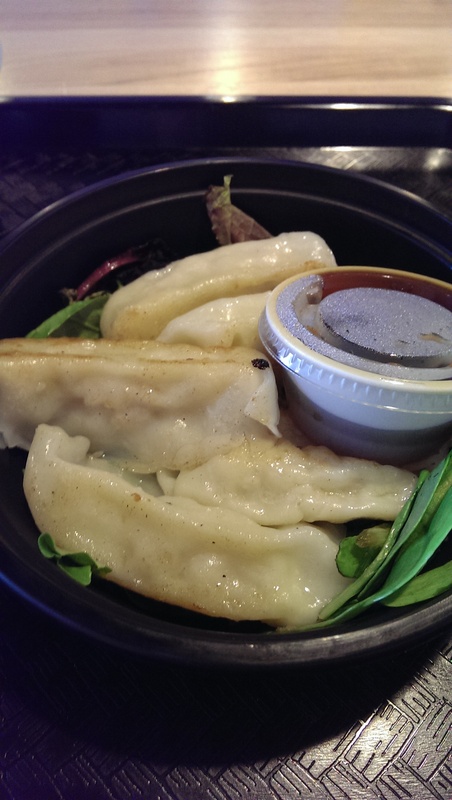 I ordered the gyoza on a subsequent trip and have to say they were pretty bad. The dough was really thin and seemed almost undercooked. I was afraid it was just going to fall apart. There is no pan frying here. The shrimp filling was decent, but the wrappings were so limp and tasteless that it negated it. I definitely prefer a more toothsome gyoza that has been pan-fried a bit more. 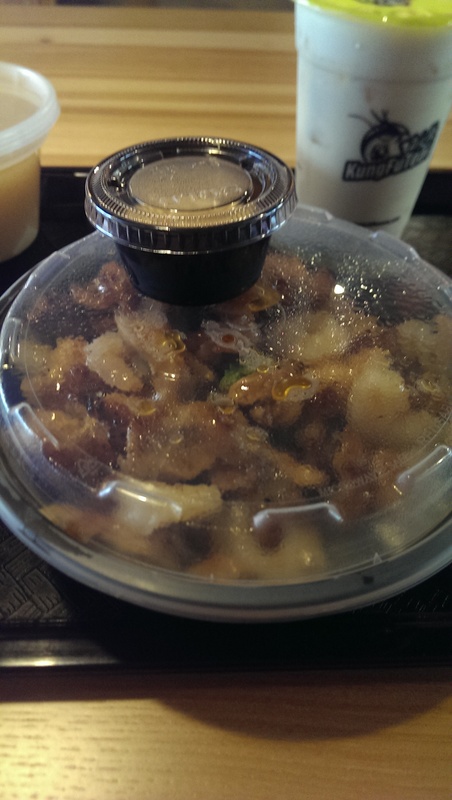 I also ordered a chicken and shrimp teriyaki bowl with fried rice. I enjoyed the flavor of the bowl, but was disappointed with the minuscule portion of yum yum sauce (pictured to the right). If you order a bowl, be sure to order extra yum yum sauce. The chicken and shrimp were cooked well and the veggies were not overcooked. The fried rice was definitely worth the upgrade. It wasn’t as good as a meal at a hibachi restaurant, but that is probably because they don’t use as much butter as they do at a hibachi. I ordered the same thing on another trip with an upgrade of fried rice for $1.50 and fried mushrooms for $1.00. The second bowl was so tasteless. This time the fried rice had no soy sauce or flavor to it at all. It was a waste of $1.50. Maybe they don’t use soy sauce to ensure the teriyaki bowls are gluten-friendly, but that is kind of the point of ordering fried rice. I noticed they serve packets of gluten-free soy sauce, but I would think you could specify gluten-free soy sauce for the teriyaki since they create each one individually in a wok. I had also ordered extra yum yum sauce, and it didn’t help much. I could have saved the extra $1.00 (yes, they charge 50 cents for each small portion of sauce). Also, some of the “fried mushrooms” also were barely cooked. If I had to choose something I would order the teriyaki bowl again and hope that the cook was competent. I for sure won’t be ordering their sushi again. Many reviewers on Yelp talked about how bland the sushi is, and they were right on point. I couldn’t quite put my finger on why that is, but I think the sushi rice is made without rice vinegar. The sushi appears to be spread on the seaweed or soy paper using a conveyor belt machine of some sort (see first picture). 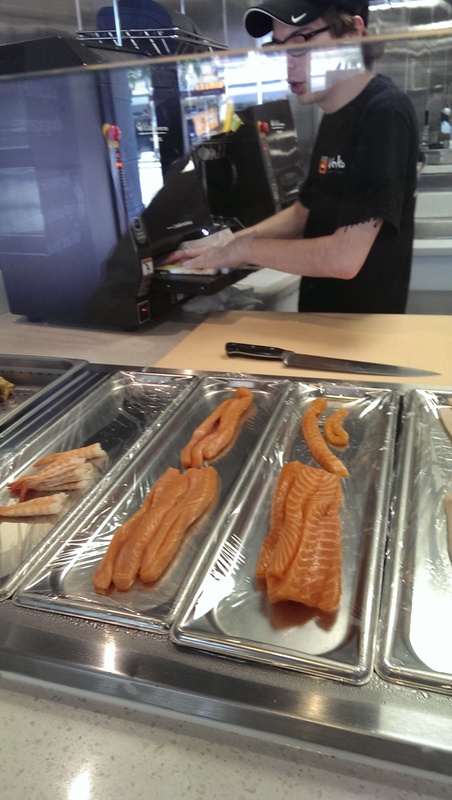 The ingredients are fresh and stretch out along the counter so you can see what you are ordering. I ordered two rolls: the Kenko roll and a make-your-own roll. The Kenko Roll features shrimp tempura, crab, cucumber, avocado and cream cheese in soy paper with a miso glaze. My shrimp tempura was sent from the kitchen when I ordered it and then assembled in the roll. I don’t think it was freshly fried because it was cold, but it had a very nice crunch to it so it couldn’t have sat out too long. That said, the roll itself was really bland. 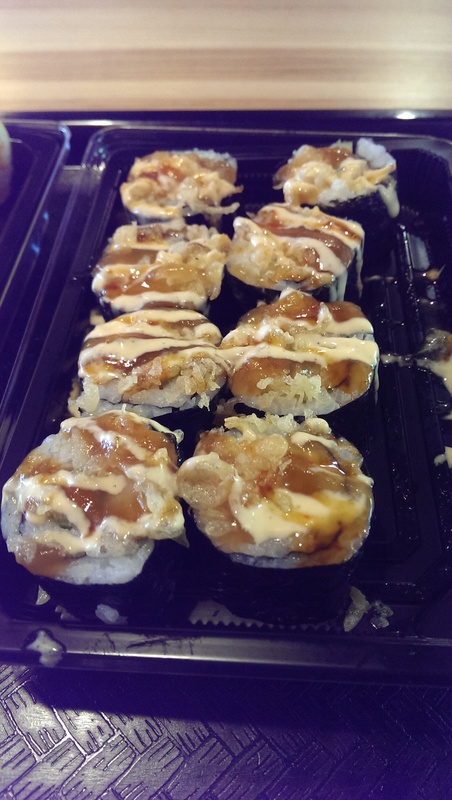 I liked the crunch of the tempura and the flavor of the cream cheese, but the other ingredients just kind of got lost. The make-your-own roll allows you to choose your wrap (seaweed or upgrade to soy paper), a protein, two “veggies” (although “filling” would probably be a better descriptor), two sauces and a topping. I went with a raw white tuna with cucumber and asparagus, tempura crumbles and sweet chili and yum yum sauce (with an added sauce of teriyaki). Despite the three sauces this sushi roll also didn’t wow me. It was better than the Kenko Roll, but I left just kind of disappointed. 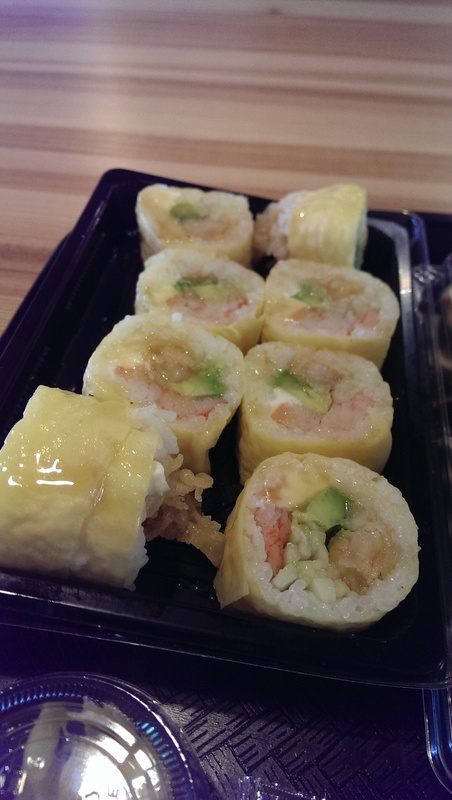 There are several other places that serve sushi nearby like Dynomite and Crop Kitchen. The employees behind the counter were pleasant and kept their cool with a couple customers who were just clueless (including me on the first visit). They patiently explained what Kaiware (sprouted daikon radish seeds) and Masago (fish roe) were to a rather loud first-time customer. The dining area definitely appears to be a hang out for university students and Kenko employees on break. There were tables of young college students enjoying themselves both times, not to mention a couple of people on laptops. Most of the seats are equipped with outlets. The thing I am most disappointed in are the lack of recycling options. They had advertised that they would be using biodegradable containers, but have since switched to black plastic containers. Since everything here is served in to go containers it’s great if you take it home and can recycle, but if you eat there they don’t offer recycling bins along with the trash containers. If I want a Kung Fu tea I will be stopping here, but honestly the food isn’t worth the price tag or the calories. 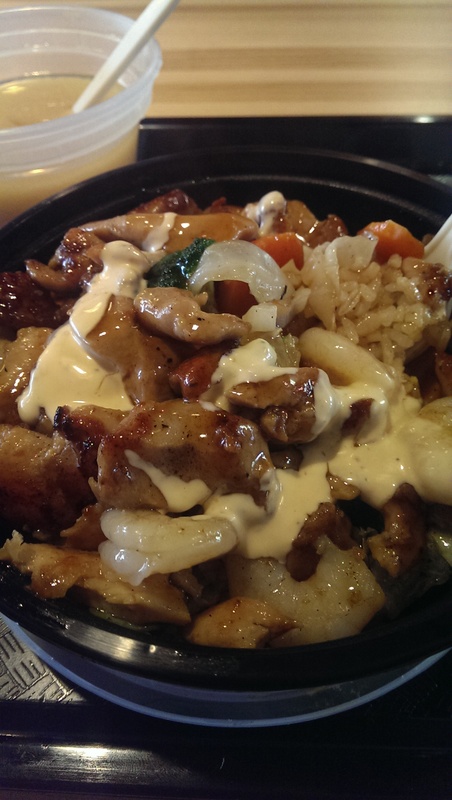 When I want hibachi flavor I am going to stick with a hibachi restaurant. I’m disappointed because I had been so excited. I’m also not the only one, because I overheard one fellow diner saying he was going to give it one more shot and then he was done too. The place does seem to attract a lot of young Asian college students, so maybe it will make a go of it. I encourage you to try it out for yourself and hope you have better luck than I did, but three tries and I’m out.